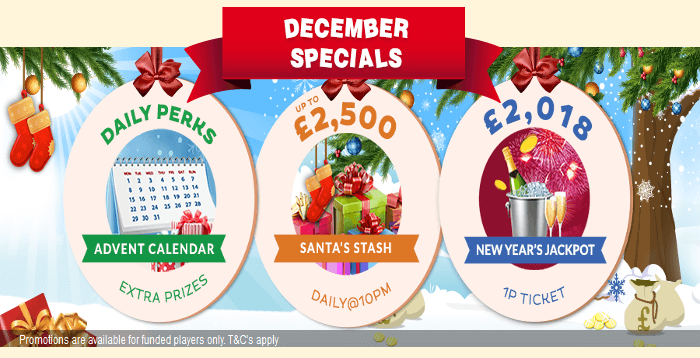 It’s that time of the year again where Christmas promotions are jam packed on our favourite online bingo and casino sites. It’s the most exciting and pulsating festival every year, so why not have a go at the most popular promotions! Have a look at some newly launched promotions at Robin Hood Bingo, Posh Bingo, Bet365 and Kitty Bingo. Enjoy December Jackpots and Specials at Robin Hood Bingo! Win daily prizes on the 31 days of Special Bingo and Slot offers. Grab your festive wins every day in your very own Advent Calendar! Here you have the chance to win Christmas gifts, jackpots, slots cashback and loads more. The Merry Bingo Market is beaming with loads of prizes and gift to give away! Market stalls with over £20,000 to win on are all open, so make sure you swing by. From the 4th December 2017, you can enjoy the daily £150 game and loads of other specials. Make your way to stalls such as: Gingerbread Hut, £1K Hot Cider Stall, £8K Christmas Jingle and Happy New Year and win big. Get hold of your very own advent calendar at Kitty Bingo. Every day from the 1st December 2017 to the 25th December 2017, grab exciting prizes like: Free Spins, Double Points on Slots, Freebies, Mystery Bonuses, Shopping Vouchers, Free Bingo Cards and loads more! Don’t forget to opt in and start collecting your prizes daily! Enjoy Christmas Party Night at Bet 365 Bingo. Head to the VIP Lounge party on the 19th December where you have two hours of Feature Games and Free Bingo to play! The VIP lounge will be packed with free bingo that night with a £250 Community Jackpot up for grabs! Start playing as from midnight 4th December to 22:00hrs on the 19th December 2017. But that’s not all, you can enjoy more at: Moon Bingo, Gala Bingo, Heart Bingo, Mecca Bingo, Sugar Bingo and loads of other sites!